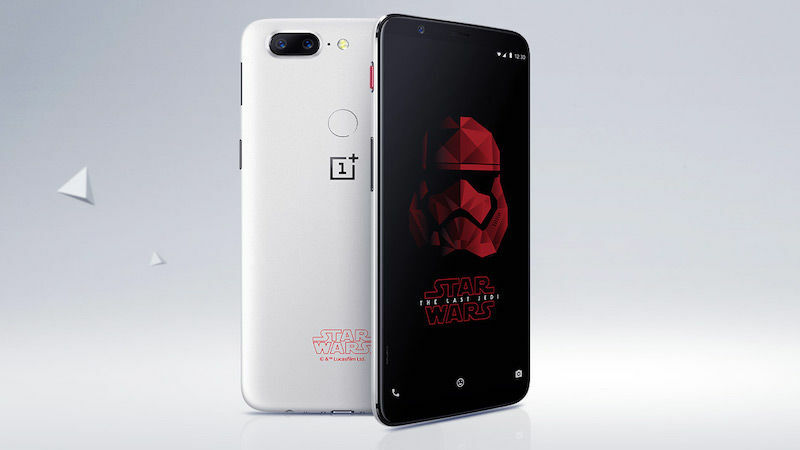 Announced earlier this month, the OnePlus 5T Star Wars Limited Edition, will be released at an event in Mumbai on December 14 at 7pm. OnePlus, in collaboration with the Star Wars: The Last Jedi, will showcase the smartphone at a special event at IMAX Wadala in Mumbai. After the launch event, a special screening of the movie will be held for fans that bought the tickets last week. The OnePlus 5T Star Wars Limited Edition will go on sale on Amazon.in, OnePlusStore.in, and at various offline OnePlus experience stores in Bengaluru and Noida from December 15, the same date as the India release of Star Wars: The Last Jedi. Apart from a white back panel, a Star Wars logo on the back, and a red-coloured Alert Slider, there are no other cosmetic hardware changes on the OnePlus 5T Star Wars Limited Edition. The smartphone does include a Stormtrooper wallpaper that matches the deep black front of the limited edition OnePlus 5T. Specifications of the new phone are expected to be identical to the OnePlus 5T launched in India last month. The OnePlus 5T sports a 6.01-inch Optic AMOLED full-HD+ display with a resolution of 1080×2160 pixels and an 18:9 aspect ratio. It is powered by a 2.5GHz octa-core Qualcomm Snapdragon 835 SoC, coupled with up to 8GB RAM and 128GB inbuilt storage that’s not expandable. In the camera department, the OnePlus 5T has a dual-camera setup with a 16-megapixel IMX398 sensor and a 20-megapixel Sony IMX350 sensor along with f/1.7 aperture lenses. On the front is a 16-megapixel Sony IMX371 sensor for selfies and video calls. It packs a 3300mAh non-removable battery that supports fast charging through the company’s Dash Charge technology. The OnePlus 5T was recently updated with OxygenOS 4.7.4 that brings camera and system improvements to the smartphone. A ‘Lava Red’ variant of the OnePlus 5T was launched recently in China.